Our English correspondent Seneca III sends the latest on the collective act of political masochism known as Brexit. I was unable to post it last night when it came in, but as far as I can determine from perusing today’s headlines, the situation hasn’t changed substantially since then. This morning the news broke that Prime Minister Theresa Mary May is going to ask the EU for a three-month extension to our Article 50 established departure date, 29th March. The requested length of this extension is significant, inasmuch as it would keep us in the EU but still preclude us from participating in the EU parliamentary elections on the 26th of May, whereas a longer extension would mean we could, and such an extension is therefore unlikely to be granted by the EU at this stage. However, as far as I can determine, there is nothing to prevent her asking for another, longer extension when the three-month one draws to a close, as by then it would be too late for us to participate in the EU elections and consequently we would have no say in its deliberations. Treachery has become thy name, woman, and that name will echo down the corridors of time, whatever deserved fate you meet. Your duplicity knows no bounds, nor should your comeuppance. Furthermore, my anger at the way this treacherous debacle is grinding on is reaching the boiling point. 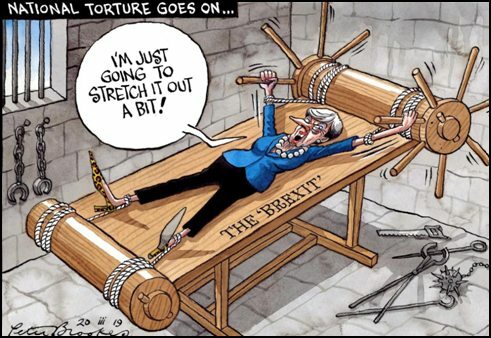 May and her cronies have filled a metaphorical pressure cooker, screwed down the lid and the safety valve and lit a fire beneath. Both the laws of physics and of human affairs suggest that there will be an explosion if the pressure within is not released immediately. For reasons beyond rational comprehension, parliamentarians seem not to understand — or simply don’t care — that they are playing Russian roulette with the lives of 60+ million people. Those people are not pawns in some game of imaginary chess; they are real and increasingly angry — unless, of course, it’s just the occasional foolish renegade like me. Yet, whilst I do not fully subscribe to precise replication as defined by the axiom ‘History repeats itself’, down the centuries there have been many similar parallels to today’s situation. Thus, I do wonder if the fact that 2019 — August 18th, to be precise — the bi-centenary of the Peterloo Massacre*, is of any significance. Because the root cause then, Suffrage, was not dissimilar to what is about us today… a powerful, closed and established political class determined to protect its sinecure at whatever cost, including the slaughter of unarmed civilians. If we do begin massive protest this year, the one thing we must not do this time is to walk naked and unarmed onto the battleground. If we crack off, we must expect to be met with draconian force and be prepared to respond in kind. N.B. It has just surfaced that the peaceful ‘March to London’ organised by Nigel Farage is being restricted to fifty persons at any given time, thus diminishing its significance in the public eye. Plod do keep insisting on marking their card with monotonous regularity; it may be that their future will become as interesting as ours. This entry was posted in Civil Liberties, Culture Wars, Europe, Insanity, Legal action, News, Politics, Stupidity, Treason, UK by Baron Bodissey. Bookmark the permalink. Who or what is/are “Plod”? What card? What mark? Who are “they”? Is this some literary allusion? “Plod” is British slang for the police. It’s usually a collective noun, and used as a plural. When I lived in England (back in the 1960s) a noddy was a motorcycle cop. I got braced by a noddy once for lighting off bangers on the Stray in Harrogate late at night. It may or may not have been on Bonfire Night; I can’t remember. Noddy has fallen from grace as being too ‘conservative’ – he is friends with the forbidden gollywogs of politically incorrect notoriety, and all 3 to 8 year olds must be made to conform. ‘Noddy’ lived in Toyland, policed by P.C. Plod, Plods appeared throughout Enid Blyton’s works, and were bumbling autocrats and spoilers, they were ignorant and bumptious and were usually made to look stupid by the hero(ine)s. P.C. Plod would happily have applied his ‘expertise’ to tracking ‘hate’ crime on the net. They were known as Plod long before Blyton used that. It comes from the days when the days when police patrolled on foot, either alone and in pairs, at a slow, steady plodding pace. You can still see that pace today on the rare occasions where in a non-emergency situation they plod along on foot. And rare such occasions are. May the Queen march the army upon that den of scum and villainy and arrest the whole bloody lot, and frog marched with an appointment at the Tower of London, where they were kind enough to put in an express lane. You vill be part of ze neu ordnung un you vill like it, Yah! I don’t understand the passivity of the Crown in this affair. It should have prorogued Parliament until March 30th. And locked up Theresa May in the Tower of London. Isn’t the Monarch the Defender of the Realm? The Queen is onboard, and Prince Phillip, when he is able, from some indications. But not Charles, the younger princes, and presumably, the staff. The Queen has to use her Royal Prerogative for to stop this madness. Will an order to the Army be regarded as binding? The Army’s purported loyalty is to the Queen, but leadership selection seems to have occurred from Whitehall. And not in a good way. Some resignations and removals these last few years. She no longer has a Royal Prerogative to prorogue parliament. Her right to do so unilaterally was taken away under the terms of Cameron’s 2011 Fixed Term Parliament Act. The only way she can do so now is at the request of a sitting Prime Minister, a request she could not refuse but she could take her time implementing that prerogative on the grounds of giving it careful consideration but this is unlikely as by definition prorogation is an urgent and time dependent process..
Well the Queen could just take control of the government by Royal Edict and send in her own Cromwell to deal with the trouble makers. Yes I know, the so called law says otherwise, but, when push comes to shove, the Queen is the highest law of the land at the point of a gun. Can a person go to the march route simply because they want to watch the march? So you have the 50 marchers, and say, 2,000 people watching them. Seems like a good tactic. Merkel to PM May “Vee Germans believe in der cooperation und you VILL Cooperate!!! Seneca 111 is correct, the utter ruthlessness the police are resorting now under the pretext of “keeping the peace” is actively stoking the fires of resentment. I now regard them as nothing less than an army of occupation ordered by an unrepresentative tyrannical clique. When this results in acts of violence the target list will be a broad one indeed, our grievance is justified. It is almost too hard to realise they have openly committed Treason for which the death penalty still stands, despite the Creature Blair’s attempts to remove it. Who would have thunk it in England? I hope people are learning a lesson herein. We belong with our fellow English speakers in the USA, not with French and German types. We are a sea people. Down with Johnny Crapeaud! …Except the Gilet Jaunes! This is how revolutions get started. And the feckless May is going to start one. It started last night in Cornwall and several incidents on British motorways dismissed as traffic “congestion”. Yeah right! A coach or two on fire-roads blocked- all in strategic places. We have the same process here in the from of the determined search for “comprehensive immigration law reform.” Implementation of e-Verify with fines and jail time cannot be effected until it can be determined whether it’s best to allow in 100 family members as part of “family reunification” or 800 family members. The “birthright citizenship” scam cannot be done away with until we decide if a path to citizenship for 40,000,000 illegals is insufficiently generous. Brexit must not, it seems, occur until absolute perfection is attained in negotiating the end of EU hositility and immigration madness.